One of the problems with driving a fast factory sports car (like a newish Corvette, M3, 911..etc) is that random people want to race you...which leaves you with the conundrum of winning these on-ramp derbys and looking like a rich buy-your-way-into-first-douche and losing your license as you murder innocent strangers in a fiery crash....so the best alternative is just to drive like a dowager in your fancy sports car confident that its Nurburgring track time is better than the next guy's. Alternatively you could buy a sleeper V8 powered Chevette, but then you need to convince those new Vette owners to race against you instead of driving like grandpa, and you still won't win the race because your wheels fall off and you still end up in jail after crashing into a crowd of nuns waiting for the bus. So...what you really need is a car that looks like it is fast, sounds like it is fast, makes you feel good about mashing the loud pedal, but is really slow and you barely exceed the speed limit. 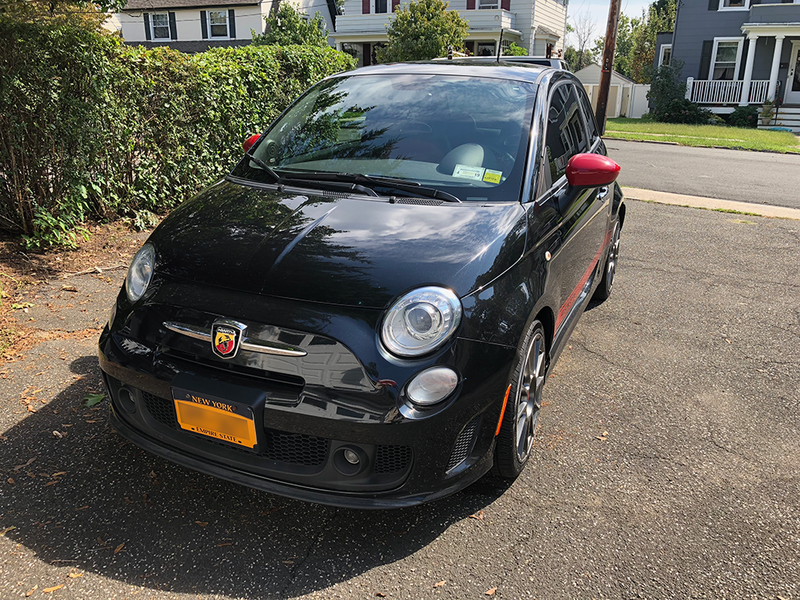 You need the automotive equivalent of a Harley...like this 2013 Fiat 500 Abarth here on eBay bidding for $8,100 reserve-not-met with $10,500 buy-it-now located in White Plains, NY. When the seller states "fun to drive", I have to wonder what else they are lying about. 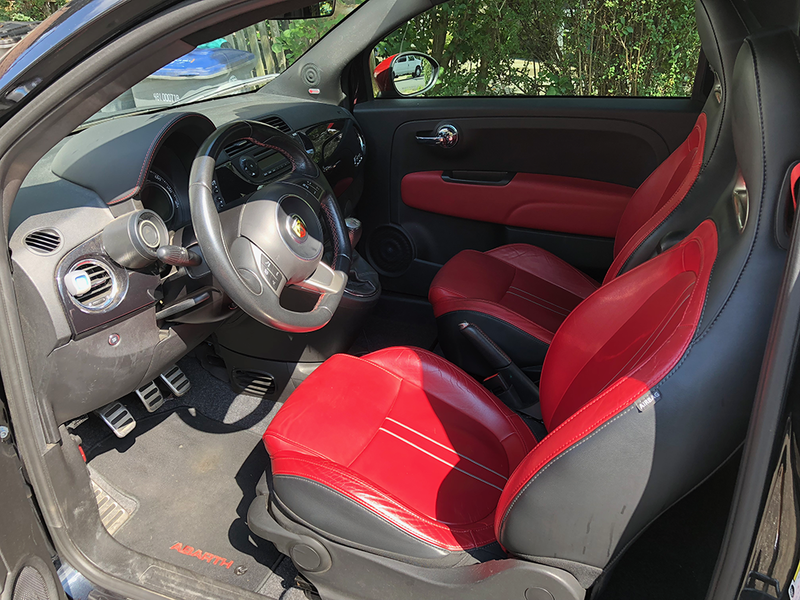 I have a 2016 Abarth in Giallo Moderna Perla with the large glass sunroof (not convertible). @Anonymous you have no idea what you are talking about, and obviously have never driven one. While a Cooper S may be a "better" car, the Abarth is much more fun to drive. Acceleration is good, with nice torque down low, but this car isn't about speed, it's about fun. Handling is good, it is sticky in the corners, is the best sounding car under $60K, and is even OK for long trips. Fold the back seats down (or take them out) and it's a very small SUV hatchback, which can carry a lawnmower. I have the automatic (faster than the stick) and it rev-matches on downshifts, and pops with flame shooting out the exhaust at night. What other car does that and gets 32mpg and is reliable? A couple of years ago, when our house was practically in the shadow of the FCA headquarters building. This was before the Abarth version of the 500 came out, but after we'd spotted a couple of Electric 500's driving around town. 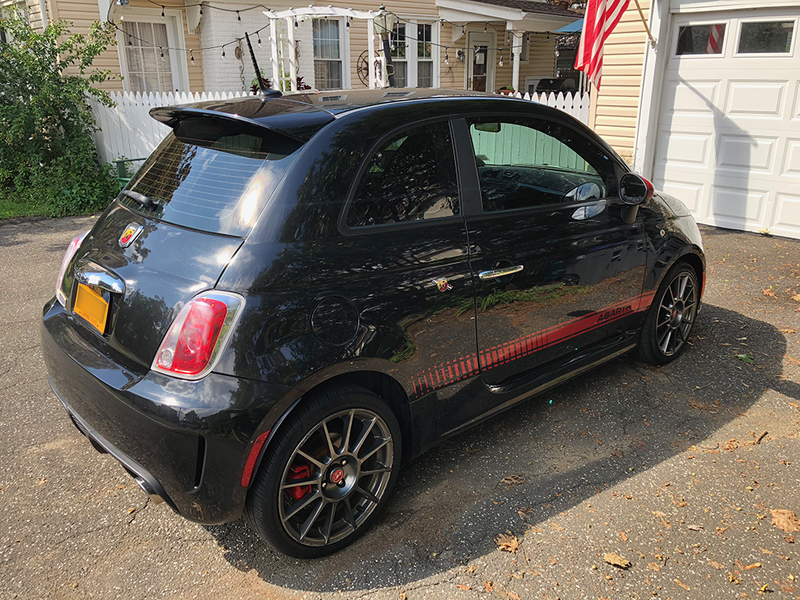 I heard one of these Abarth's driving through the neighborhood as I was out walking our dog. It sounded like it was absolutely haulingazz through the neighborhood, but wasn't going super fast. The car was wearing Manufacturer plates, but wasn't all disguised, so I flagged the driver down and asked him about it. We talked for a minute and I finally commented that it sounded like an absolute blast to drive. He said something to the effect of "it isn't quick but it feels like it is, which is huge fun". Basically, the same answer I would have given anyone in the mid-1960's who asked me if attaching playing cards with clothes pins, to the spokes of my bicycle made it faster. It was my belief that made me feel good, not the actual performance. These have the best sounding 4-cyl engines. I would agree! I didn't make that point strongly enough in my comment. What caught my attention to this car was the great sound of it. Their raucous exhaust is fortunate, as “Audio by Beats” should have been left on the unswept floor of whatever eager beaver ad exec’s office after the powers that be had a chance to sample this brand of low-fi frivolity. @Brian Ach I've noticed that of enthusiasts own Abarths to daily. I've got one when I need to squeeze into LA parking spaces. Also to save my 996, Boxster and Lotus for the weekends. When ever I talk to him at the market he is either in a JCW mini or Abarth. He says they are more enjoyable then the majority of his cars.